ServiceMax, headquartered in Pleasanton, Calif., develops field service software solutions based on the Salesforce1 platform, designed for companies of all sizes. ServiceMax is offered in two licensing tiers, ServiceMax Express and ServiceMax Enterprise. ServiceMax Express, designed for smaller companies, has a 5 user minimum licensing agreement, and includes all the basics for running your company with mobile field service management software. 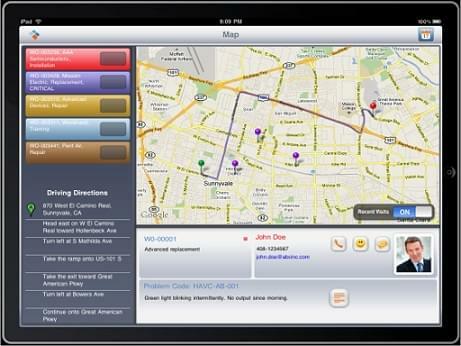 Field and office-based users can access and collaborate on schedules, work orders, dispatch operations, and more. The iPad application for field service technicians supports barcode reading, offers service-level agreement timers, and lets field workers access a full product catalog and knowledgebase. Furthermore, technicians can use FaceTime to escalate work problems and collaborate with subject matter experts, no matter where they may be. The mobile application even allows input while offline, and will sync with the server once a connection is restored. ServiceMax Enterprise is a truly end-to-end solution for your service-based business. With functionality approaching that of an enterprise resource planning system, ServiceMax Enterprise offers all the functionality of the ServiceMax Express edition, adding support for Entitlements and Warranty, more advanced contracts and scheduling, more robust inventory management features and depot repairs, advanced analytics, and add-ons for reverse logistics, accounting integrations, community forums, and services optimization. ServiceMax has won numerous software industry awards and is used for printing services management, real estate management, HVAC services/repair, medical device warranties, and much more. On average, ServiceMax customers see ~26 percent increased productivity, ~22 percent increased service revenue, a 14 percent reduction in costs, an increase to first-time-fix rates of 18 percent, and decreased average time-to-repair by 19 percent. If you’d like to learn more about ServiceMax or comparable field service management solutions, see our Field Service Management Product Selection Tool, or if you’d prefer, call, click, or email to speak with an unbiased Technology Advisor for a no-cost, no-obligation consultation. Learn everything you need to know about ServiceMax. Our experts will reach out to you shortly.